Born in Vancouver on August 27, 1914, Roy was a man who from the time he was a youngster wanted to do something that would help his fellow man. Though he wasn’t able to enroll in medicine, he ended up taking nine years of study at UBC, surfing between arts and engineering before getting degrees in both and a master’s degree in metallurgical engineering. He loved this experience and, as he remarked years later, it paid off in both his career and life; specifically he developed an uncanny ability to blend the simple, yet elegant, solution to any kind of technical challenge. His first job in the often dangerous business of mining, in the Cariboo Quartz gold mine in Wells, BC, introduced him to his future wife, Vera Macdonald, a nurse at the local hospital. Soon after marrying Vera in 1941, he joined the federal government where an unusual opportunity arose to take a crash course in industrial hygiene at the Harvard University School of Public Health. Roy was a founding member and a president of the Vancouver Industrial Safety Council; president of the Greater Vancouver Health League that fostered vaccination and inoculation; and the first president of the Poison Control Council. For years, he unfailingly supported Vera in a passion of her own: the Canadian Diabetic Association. In 1969, after almost a quarter century working with BC Hydro, Roy was recruited by the federal Department of Labour to help introduce Part IV of the Canada Labour Code, enacted to promote the occupational safety and health of persons employed in federal industries, Crown Corporations, and the federal public service. 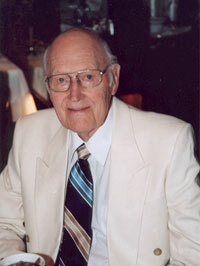 During this same tenure, Roy was instrumental in setting up the Canadian Centre for Health and Safety in Hamilton, ON. Roy also conducted a Commission of Inquiry into the Glace Bay coal mine disaster under the authority of the federal Enquiries Act, which led to the controversial closure of the mine. In the years following his retirement, Roy and Vera became avid cruise ship aficionados, frequently dashing off to the far corners of the world. A love of painting in oils and watercolours was a trademark of Roy right up until he passed away peacefully in Tsawwassen on April 9, 2011, just shy of his 97th year. He is survived by his three sons, Gary, Kerry and Peter Elfstrom.